We can safely say that CougarLife is arguably the most enjoyable dating service out there. It’s well-rounded and works flawlessly. Apparently, the above-average fees that they charge don’t go to waste, but their relatively high prices grant them no more than 4/5 on our rating. In 2008, a Canadian company Ruby Life Media has launched CougarLife – a dating platform designed specifically for mature women and younger men who prefer such women. And it was about time! Traditionally, the image of a cougar could not boast positive associations too much. Eligible women in their 40s or even younger could not have an affair of any kind with a younger gentleman without getting the whole town gossip behind her backs. Naturally, some communities were more progressive than the others, but the stigma was still there. Like all stereotypes, it was a double-edged sword hitting both single women still in their prime and young men who appreciate a seasoned and experienced woman. People in Ruby Life Media have realized that there is an audience for such a model of an online dating service and decided that this niche deserves as much attention as any other. Even though they are not too big on pathetic words to describe their noble mission of de-stigmatizing relationships between older women and younger men, the very existence of a service like CougarLife deserves praise. There are many respectable reasons why a woman in her 40s or older can look for romance – she may haven’t started a family yet because she had different priorities in life, she may be divorced or widowed, etc. And there is no reason why she should deprive herself of having a personal life. Often, the very realization that there is an entire community of women, just like herself, who are looking to meet younger men is enough to make her feel more confident and make her life brighter. Likewise, it is often important for a younger man to realize that it’s not wrong or even uncommon to desire a mature woman. But this is all philosophy. Let’s move on to the service itself. According to this fashion, the front page is somewhat flashy yet inviting. It’s quite functional and laconic, too. You can instantly see the sing up and log in links, and if you scroll down, you can see a brief overview of the service and some of its features. In other words, you are invited to register and create a profile without further ado. CougarLife also seems to pose itself as international service. The website has an English, German, and Spanish versions. Even though there is no option to sign up with your Google or Facebook account, the registration process is arguably the quickest and most straightforward of all dating services. It goes in only one step and asks only a few details – from your email address to your hair and eye color. Some essential details are not mandatory, like uploading a photo or writing your profile’s greeting line – the first and second things that other users will see in your profile, respectively. You can take your time and fill those gaps later, no rush here. In general, CougarLife only asks you the essential questions and avoids the non-essential ones. For example, as a website aimed at a heterosexual audience, it always assumes that an applicant prefers the opposite gender. Altogether, the process shouldn’t take longer than a minute or two and is free. Once done, you are welcome to make your profile even more representative by answering some of the optional questions of which there are many. We’d like to emphasize their optionality: it’s best if you only answer those that are significant to you. If you answer all of them, you’ll turn your profile an unnecessarily long and tedious read, which will not be attractive to other users. In general, we have noticed a minimal amount of “empty” profiles: CougarLife members tend to have attractive and well-rounded accounts. After creating a profile, you are welcome to look around and view other users’ accounts. You can instantly use the search functions to look for members by such criteria as age, height/weight, hair/eye color, etc. Alternatively, you can just see who’s online in your area at the moment. When you find someone attractive, you can send them a flirt or add them to your favorites’ list. Unfortunately, CougarLife’s functions available to free users stop here. Even so much as sending messages to other users and receiving them is only available to paying subscribers. This means that you won’t even get notified if someone writes to you. You will, however, know if another user adds you to their favorites’ list. Virtual gifts. These are various tokens of appreciation to show your love interest that you care about them. Admittedly, it does sound somewhat lame, but it works well when the two have not yet grown close enough to share personal contact details and cannot send each other a bouquet of flowers or another small present in real life. Besides, it’s only fair to buy virtual gifts for virtual money (CougarLife credits). Priority messaging. This is a unique feature to make sure that your message will be on top of your recipient’s list. If you have reasons to think that your love interest has many suitors and gets many messages, it’s only reasonable to be concerned that they might not see your message in their feed – merely because of the sheer quantity of letters. To avoid that, you can spend a couple of credits and have your message highlighted on top of their list. In addition, priority messaging feature allows you to attach photos to your messages. Note that if you ever happen to run out of credits, you can always purchase some extra. Private photo galleries. Some people are shy to share many photos of themselves with strangers and think that a profile pic suffices for a first impression. Others, on the contrary, would like to share some of the more intimate photos that someone might deem indecent. CougarLife doesn’t judge either of the group. Instead, you get the option of starting a private photo gallery. This way, you can grant access to this gallery only a chosen few. If you see a blurry photo with a lock icon on someone else’s profile, it means there’s a private gallery behind it. To access this private gallery, send this user a request by clicking on this lock icon. Find A Date Tonight feature. If you have a spare night and wouldn’t like to spend it studying other people’s profiles, there’s an option to find a date for tonight without further ado. If you feel like going out for a coffee or a drink right now, you can indicate so in your profile and wait for someone equally lonely and willing. 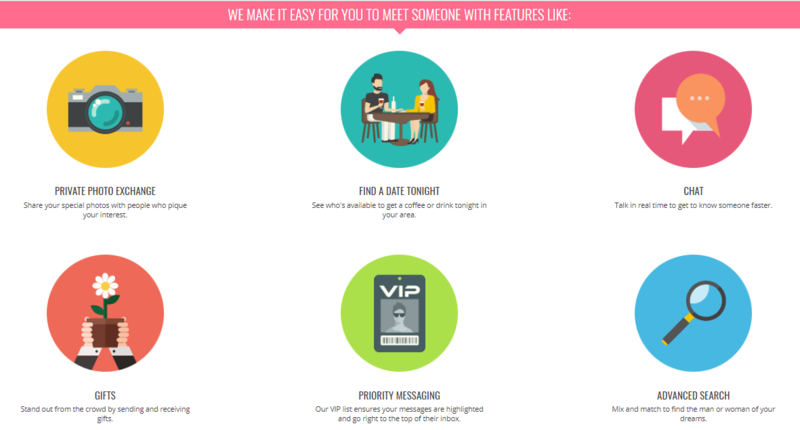 Or, you can hit the Find A Date Tonight button, and see who’s up for a date right now in your area. There is a CougarLife app available for both iOS and Android users. Comparing to the desktop version, it doesn’t offer anything new, but it also doesn’t miss any of the functions. In other words, it does whatever an app version of a dating website should do – grant you access to all the service’s functions on your mobile device. It looks like instead of adding new gimmicks, the developers have decided to focus on the app’s performance: it runs remarkably quickly and smoothly. CougarLife has two channels for customer support: a hotline and a submission form in the Contact Us section of the service. To be exact, there are three hotlines: one for the US and Canada, one for Australia, and one for the UK, none of which is 24/7: they can only be reached between 9 AM and 7 PM. Considering the selection of languages on the website, it seems somewhat strange and inconsistent. On the one hand, the website welcomes Spanish- and German-speaking members (supposedly, from Latin America and Continental Europe). But on the other hand, the website doesn’t offer them the same benefit of customer support via phone. If there’s an issue you need to clarify but cannot call CougarLife’s hotline, you’ll have to use the submission form on the website. You will still get quality support, but you will have to wait a little longer. You may have noticed that we haven’t paid too much attention to the disadvantages of CougarLife. Judging by our review, it may seem like their only significant drawback is the limited choice of features for non-paying users. In this case, it is significant indeed – because the subscription prices are notably above average. The basic one-month subscription costs as much as $40. As always, you can opt to pay less by paying more and buy a three-month subscription for $87 ($29/month) or a one-year subscription for $144 (only $12/month). More expensive subscription plans also grant you more CougarLife credits for which you can purchase additional features that we have described: one-month subscription gives 100 credits, a three-months subscription gives 500 credits, and a one-year subscription grants you as much as 3,000 credits. Extra credit packages are also available for purchasing, and their prices vary seasonally. If you are having second thoughts as to whether you should pay this kind of money for an online dating service, there is an extra feature you can buy: CougarLife’s Ultimate Match Guarantee. For an additional fee, the site will guarantee that you will find a match within three months. If not, they agree to renew your subscription for free. Speaking of subscription renewals, CougarLife does it automatically. It means that when your subscription expires, you will get billed for another one of the same value. If you don’t want your subscription renewed, contact the support to have them switch the auto-renewal off. Note, there is no way to do it yourself in your account settings. As we have mentioned, it will be faster to reach them via the hotline. If the hotline is not available in your area, make sure to do it well in advance. If you fail to get in touch, you will have to keep your subscription because CougarLife doesn’t have a refund policy. The website accepts all major credit cards, as well as PayPal. Final verdict: Is CougarLife worth your money? If you are reluctant to pay that much for online dating, rest assured that there are indeed other sites for “hunting” cubs or cougars, even though they might not advertise as such. “Cougar” is not nearly as much of a stigma as it used to be, so you can feel free to use general dating services and express your desires openly there.